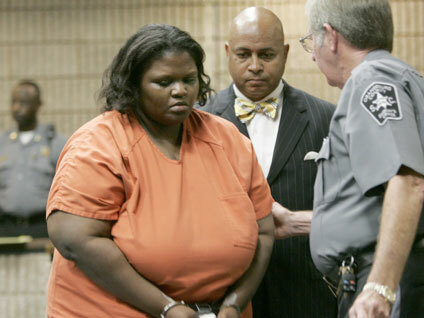 ORANGEBURG, S.C. (CBS/WLTX) Shaquan Duley, the South Carolina mother accused of suffocating her two young boys and staging an accident to cover it up, made her first court appearance Wednesday morning. Duley faces two murder charges in the death of her sons, 18-month-old Ja'Van and 2-year-old Devean, according to CBS affiliate WLTX. "She's been very sad, very remorseful about all this stuff, all the allegations," said defense attorney Carl B. Grant after a brief hearing in Orangeburg. Duley held her head down and said nothing during the hearing. "I know the world wants to know, 'What happened with Shaquan Duley?' That will come out," said Grant. Duley originally told authorities that the children drowned when their car careened into the Edisto River Monday and that she couldn't manage to get the children out, but, according to Orangeburg County Sheriff Larry Williams, the 29-year-old mother later told police that she was "distraught" after a dispute she allegedly had with her own mother and killed her two children by putting her hand over their mouths at a local motel. According to investigators, Duley then strapped the boys' lifeless bodies into child safety seats inside a car, and drove to the Edisto River where officers believe she allowed the car to roll into the river from a boat ramp, reported WLTX. There were homes near the bridge road where the tragic incident occurred. However, Shaquan Duley walked three-quarters of a mile from the river and found a driver who had a cell phone. The driver then called police. The two boys were dead when the divers got to the car near a rural boat landing about 45 minutes later, said Williams. "She truly felt, 'If I don't have these toddlers, I can be free,'" said Williams Tuesday. "I think she was fed up with her mother telling her she couldn't take care of her children, or she wasn't taking care of the children and just wanted to be free." Duley lived with her sons, a 5-year-old daughter and her mother in a rented home along a street cluttered with boarded-up, abandoned houses in Orangeburg, approximately 35 miles south of the Columbia, the state's capital. Unemployed and estranged from the children's father, Duley relied on her mother to financially support her and her three children, said Williams. A circuit court judge will decide whether Duley will get bail. A date has yet to be scheduled for that hearing. The funeral for Ja'Van and Devean is scheduled for 11 a.m. Friday at St. Paul Baptist Church in Orangeburg. Duley's daughter is now in the care of her mother.